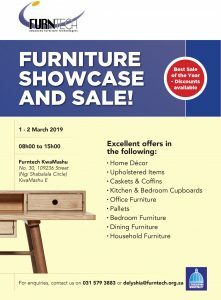 Furntech White River invites you to the exhibition and factory sale of locally manufactured furniture. Are you a ‘retail buyer’ looking for local furniture manufacturers as suppliers? Are you an ‘interior designer or decorator’ looking for custom made furniture? Are you a ‘hospitality industry buyer, property developer, architect or homeowner? Are you an existing or potential entrepreneur looking to start, build and grow your business?